Content marketing conferences bring together everyone from the best in the business to the new kids on the block. They bring together groundbreaking ideas and industry-defining talent. Hopefully, you’ve already taken a look at the 2018 content marketing conferences and have decided which would be best for your business. These conferences are a chance to not only reinforce and expand your network but also to put your business on display for the world. This is where you can show off and differentiate your brand. If you’re going to make an unforgettable impression, however, you need to bring your A-game to these conferences. It costs time and money to attend these events, so you’ll want to maximize every moment of preparation and attendance. Here are four tips for tackling content marketing conferences. Setting goals should already be a habit of yours, and that habit is easily applied to conference attendance. Start by outlining what you hope to achieve by attending this specific conference. Maybe you’re on the hunt for new clients, or maybe your business is facing a problem that other businesses in your industry are also confronting. Whatever the problem may be, you’re going to this conference for solutions. As you go throughout the conference, remember your purpose for being there. There will be many panels, workshops, and keynotes and you may need to sacrifice attending some of those for something that will help to complete your goals. Make sure that the members of your team attending the conference are well aware of the company’s purpose for being there. If you want to make the most of a conference, then you need to make a plan that’s centered around the goals you just set. This plan should be your guide for nearly every minute of the conference, otherwise, it could be easy to get distracted. Plans help you stick to your priorities. Get ahold of the conference agenda and map out which workshops, panels, and keynotes that you’ll need to attend. Find out what vendors will be there (if that’s part of the conference) and set aside time to visit businesses you’re interested in. You should also look at the attendee list and decide if any attending experts would be worth setting up a one-on-one meeting with. Set up any meetings before the conference starts, when these experts, and others that you want to meet up with, are determining their own schedules. If you’re bringing a team to the conference, it may be useful to divide and conquer. Help set individual plans for each member of your team (unless you need to meet with someone as a complete body) so you can cover more ground and more comprehensively fulfill your purpose. While you may want to spend every moment of the conference being productive, you’re going to be no help to yourself or your business if you’re a stumbling through with glossed over eyes. Conferences are exhausting, and you’ll need to preserve your energy for the most important priorities at the event. Before the conference, get plenty of rest, go to bed early the night before you travel, and eat healthy meals. Try to arrive at your hotel early so you can get your bearings and go over your plan one more time. Stressing and rushing will only exhaust you faster. At the conference, continually gauge your energy level. If you’ve been at the conference since the early morning and have something important to attend that night but you can barely keep your eyes open, consider skipping the panel you were going to attend in the afternoon. Go back to your hotel and get some rest. Using your goals as a guide, save your energy for the most significant priorities. You’ll leave this coming conference with plenty of notes and, hopefully, some big ideas for improving your business. But if you do it right, the most important thing you’ll leave this conference with is a fresh list of beneficial connections. Before you jump into networking, you need to get your head in the game. Start by recognizing that you’re not the only one who’s a little nervous about making connections. Most attendees feel the same. And if you’re about to meet a respected industry veteran don’t be intimidated by their status, most of them would love to speak with you. If there is someone specific you want to connect with at the conference, do some research beforehand. Look into what they’ve been doing recently and check out their social media posts to see what’s been on their mind. When you bring up these topics in conversation, you’ll show that you respect them and are genuinely interested in their work. Practice bringing up those topics, or display your knowledge of them, organically as your new friend may not feel too comfortable when you randomly bring up their penchant for cat videos. The truth is, however, that many beneficial connections will be made with people that you never planned to meet. In order to create those connections, you need to make yourself open to such opportunities. As you’re walking through the conference, smile, make eye contact, and don’t be afraid to say hello. We promise that it won’t be out of place, you’re there to network! Sit in the front rows as much as possible. Choose empty seats at tables where you don’t know a soul and take the time to get to know the people you talk to, you don’t need to solely focus on business. Once you’ve laid the groundwork for network connections, keep the conversations going after the conference. Connect on LinkedIn, follow them on social media, and keep in contact through email, Slack, or whatever works for you. Approach content marketing conferences as you would any campaign: set goals and make and execute plans with your purpose in mind. 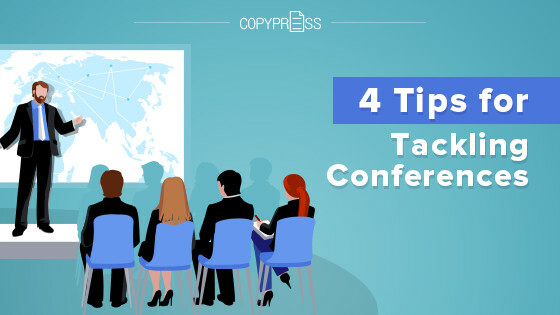 Tackle conferences with these tips and you’ll leave with the strategies, tools, and connections you need to grow your business. And if you see CopyPress at a content marketing conference, come and say hi!